When I think about the plot of Spike Lee and Jordan Peele's film, BlacKkKlansman, about the true story of an African-American cop who infiltrates the KKK, the first thing that pops into mind is that David Chappelle skit about Clayton Bigsby, the black white supremacist. It just sounds silly as Hell, and certainly too weird to be based on fact. And based on footage from CinemaCon it seems that Lee has decided the best way to tackle it is to make it more like a buddy comedy than one of his incendiary pieces about race. 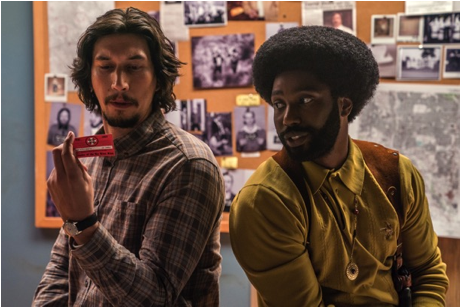 We're picking up on the retro cop comedy vibe Lee is laying down in the first official trailer for BlacKkKlansman, which stars John David Washington as Ron Stallworth, the first African-American cop in Colorado Springs, and Adam Driver as his partner Flip Zimmerman. Together they find a way inside the KKK to expose a terrorist plot. While the tone for this maybe different than people were expecting, especially as it premieres to compete for the Palme d'Or at Cannes, it's not without echoes to today. Topher Grace plays former KKK Grand Wizard David Duke, who has been more in the news lately than ever as the white supremacist movement has been emboldened. Just how far has the civil rights movement come in light of something like that? Lee seems to be addressing that in some way with this movie. Also starring Laura Harrier, Corey Hawkins, and Ryan Eggold, BlacKkKlansman opens August 10th.